Soap films can behave like membranes. Every cell in your body needs to take in nutrients, oxygen, and raw materials and export wastes and other substances—but it’s not just a random traffic jam! A cell membrane (also called a plasma membrane) regulates what comes in and what goes out. Explore the properties of soap films and relate them to the properties of plasma membranes and the mechanics of transport across membranes. To make your bubble solution, mix dish soap and water in a 1:10 ratio, adding one tablespoon of glycerin to each gallon of solution. Let the solution age at least overnight for the longest-lasting bubbles. Cut the bottoms off of the film cans. To do this, use a sharp knife or a single-edge razor blade to pierce the side near the bottom then cut the bottom off using sharp scissors. Make sure that there are no rough edges. Alternatively, cut a 2–4 inch (5–10 cm) section of PVC pipe with PVC cutters or a hacksaw. Fill the roasting pan with the soap solution to a depth of at least 1 inch (2.5 cm). Cut a piece of string that’s approximately four times the length of the straw. Thread it through the two straws and tie the ends together to make a loop (see photo below). Move the straws and string into the shape of a rectangle. This is your bubble frame (see photo below). Cut the excess string from the ends of the knot. Move the string through the straws so that the knot is hidden inside one of the straws. To create a handle for the frame, cut another piece of string that’s approximately three times the length of the straw. Thread the string through one of the straws and tie the ends together (see photos below). This activity is easiest to do with at least two people. 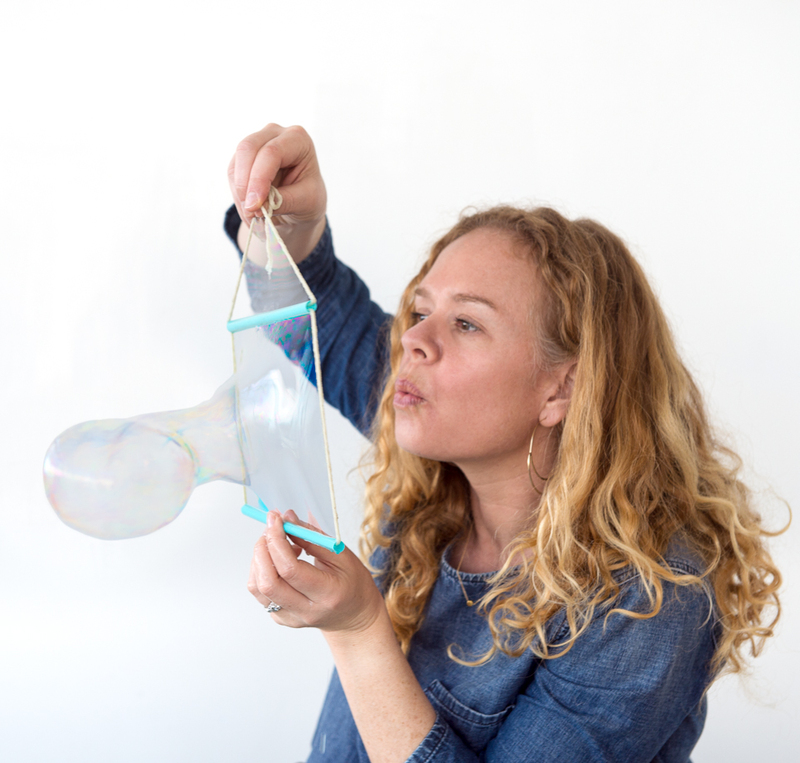 One person can make the soap film and hold the handle while the other person explores how the film behaves. Shape the bubble frame into a rectangle. Holding the frame by the handle, immerse the entire frame into the bubble solution. Lift the frame up by the handle until the bottom of the frame is slightly out of the bubble solution and the straws are parallel to the tabletop. You should have a rectangular soap film between the two straws. If there isn’t any soap there try immersing and lifting the frame again. Hold the soap film in front of the black construction paper or other black material. Carefully observe the surface of the film. Blow gently on the film and watch what happens. Repeat the first two steps if the bubble pops while you are completing the steps below. Wet your finger in the bubble solution. 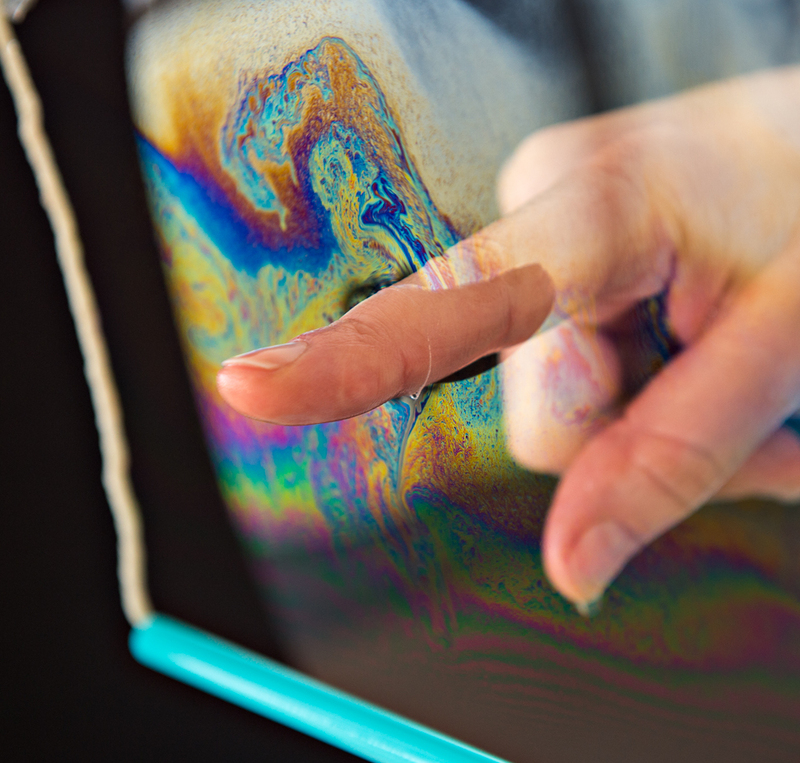 Gently poke through the soap film with your finger. What happens? Can you move your finger around in the film? Now wet a non-soapy finger in plain water and poke it into the film. What happens? Try gently poking a dry finger through the soap film. What happens now? Make a new film on the frame. Roll a film can or PVC tube section in the bubble solution to coat its surfaces. Grasp the film can near one end, and remove it from the solution. If films have formed across the openings of the can, pop them. 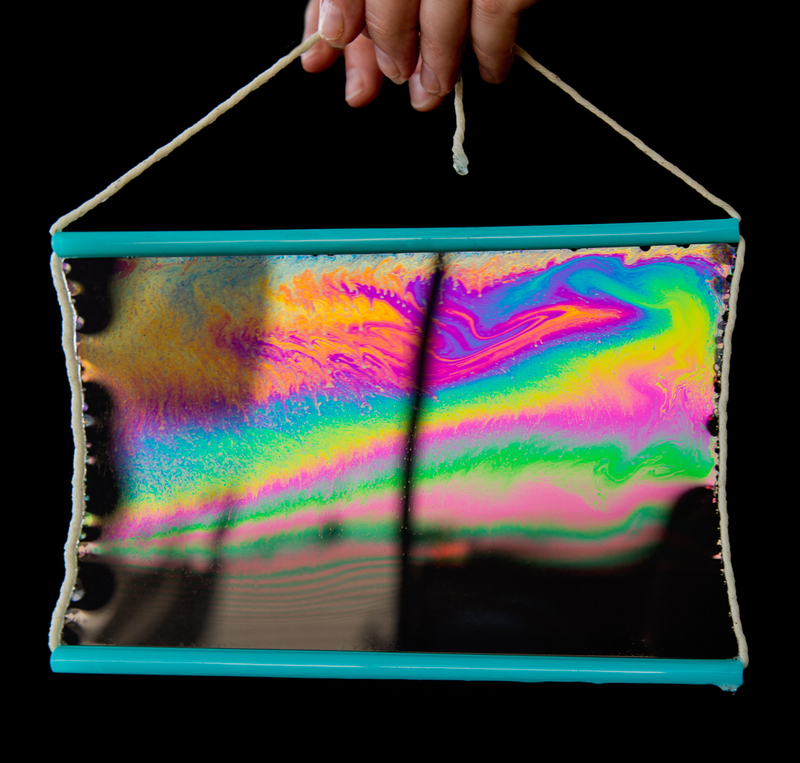 Insert one end of the film can through the soap film on the frame. If the film pops, make another and try again. When you successfully insert a bubble-coated film can through the soap film, leave the can in this position and have your partner pass an object (such as a pen) through the openings of the can, from one side of the film to the other (see photo below). Can you move the film can around in the soap film? Try putting a dry film can through the soap film. What do you notice? Based on your observations, what conditions allow objects to pass through the soap film without popping it? What conditions cause the film to pop? Do you think the flexibility of the film influences its ability to resist popping? Why or why not? Both the bubble membrane and plasma membrane create a somewhat fluid barrier between two distinct sides. While the bubble membrane only separates arbitrary right and left sides of the bubble, the cell’s plasma membrane separates the interior and exterior of a cell. In both cases, the membranes are semipermeable, meaning that they allow certain substances to pass through while others can’t. The soap film is a “water sandwich,” a layer of water positioned between two layers of soap molecules. The hydrophilic (water-loving) heads of the soap molecules point inward toward the water layer, and the hydrophobic (water-hating) tails of the soap molecule point to the outside of the film, in contact with the air (see diagram below). Like the bubble, the plasma membrane also has a bilayered structure. In a cell, though, the membranes are made of molecules called phospholipids, which have hydrophilic heads on the outer layer of the membrane and hydrophobic tails on the inner layer of the membrane (click to enlarge the diagram below). When a finger, film can, or other object is coated in water or bubble solution and inserted through the soap film, the film remains in contact with a “like” solution and doesn’t burst. In contrast, a dry object or an object with a different chemical make-up shears the film. Like the bubble membrane, a cell’s plasma membrane will also allow molecules that have a similar chemical makeup to the interior of the membrane to pass through. For cells, this includes molecules that are hydrophobic, like the bulk of the membrane. Some polar molecules that are partially charged are also able to pass through the membrane, but it is their small size that enables them to do so as they pass through the spaces between the phospholipids. Large polar molecules, such as glucose, and fully charged ions, such as H+, Na+, and K+, require special transport processes to cross the membrane. The film-can “channel” in the bubble membrane models this type of movement, allowing materials that are unlike the membrane to cross it. In cells, the channels are made up of proteins that are embedded in the membrane. Protein channels in the plasma membrane are not simple tunnels. They undergo complex shape changes and often require energy to move molecules across the membrane. Like the film can, the protein channels are not fixed and are able to move within the membrane. This bi-layered, flexible membrane with mobile channels is known as the Fluid Mosaic Model. Coat a finger with a different type of material (vegetable oil or rubbing alcohol, for example) and see if you can penetrate the film without popping it. Try it several times with different fluids. What do the fluids that work seem to have in common? Before students begin this activity, it’s helpful for them to have a sense of what an organism requires to move into or out of its cells and how molecules move across membranes according to concentration gradients. The Naked Egg Snack helps students make observations about large-scale molecular movement across a membrane before they take on the structural components of cell membranes in the Cellular Soap Opera Snack, and it provides a context for their learning. By combining these types of activities in sequence, students can formulate a revisable model about how osmosis and diffusion occur, and what might prevent or allow molecules to move through membranes. Some teachers have even incorporated engineering practices by having students engineer channels that allow certain types of molecules through while blocking others, as channels in the plasma membrane do. When using this type of model with students, it’s important to have them consider both the similarities to a plasma membrane and the limitations of the model. When combined with other models (such as that developed in the Naked Egg Snack), students are able to make sense of what parts of the models match which aspects of our understanding about transport of molecules across cell membranes.